A Colombia honeymoon can wrap you in colonial charm, ecotourism, island adventures, city excitement, and much more at very affordable rates. And Colombia is not far from the USA: Flying time from Miami is 2.5 hours, from Houston it's 3.5 hours, and from NYC it's 5.5 hours. The best part is that Columbia is on the same time zone as the eastern USA, so many honeymoon couples won't experience jetlag after they visit. "Tens of thousands of U.S. citizens safely visit Colombia each year for tourism, business, university studies, and volunteer work. Security in Colombia has improved significantly in recent years, including in tourist and business travel destinations such as Bogota, Cartagena, Barranquilla, Medellin, and Cali. However, violence linked to narco-trafficking continues to affect some rural and urban areas." Reaching into both the Atlantic and Pacific oceans, Colombia's vacation venues range from cities and beaches to islands to snowy Andean mountaintops. The following destinations in Colombia, South America, are most likely to appeal to couples planning a honeymoon or romantic getaway. 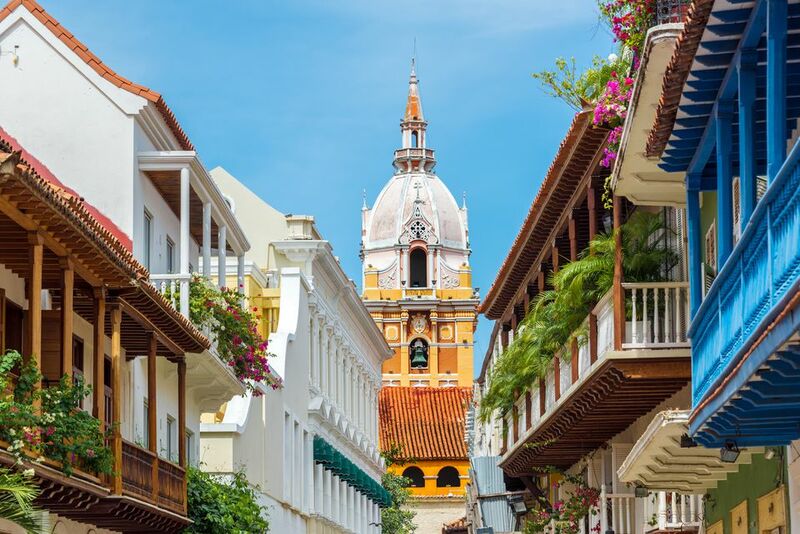 The charming, coastal city of Cartagena is becoming increasingly popular with honeymoon couples. A fusion of European and Latin style make this former Colonial fortress both fun and fashionable. Savor meals in beachfront boites along the country's Atlantic coast, take romantic carriage rides down cobblestone streets, and sleep in high-style hotels. If part of your honeymoon fantasy involves visiting a near-deserted island, take the hourlong boat ride across Cartagena Bay to reach nearby Rosario Island. The beaches are golden, the turquoise waters are warm, and you'll encounter marine life in their own open-water aquarium. Colombia's capital city, Bogota is the choice for a sophisticated honeymoon. Located in the center of the country, Bogota is home to many fine restaurants and hotels as well as two unique museums. One is dedicated to the work of the inimitable artist Fernando Botero and the other to the city's original raison d'etre: gold. Couples who want to spend their honeymoon biking, browsing art galleries, and clubbing at night to a Latin beat will find ample reasons to visit. Like to scuba or snorkel? Colombia's Caribbean islands, San Andrés and sleepy Providencia, are surrounded by one of the most well-preserved coral reefs in the Caribbean. And their towns are nearly as colorful and the marine life below. Just don't be surprised when immigration takes your passport away for safekeeping when you arrive. They know what they've got here. So they want to make sure that after you enjoy the locations, you head back home -- and spread the word that you've discovered Colombia's pristine beach paradise. Although Juan Valdez, the symbol of Colombian coffee, was fictitious, the nation's reputation as coffee purveyor to the world is not. The Coffee Triangle — three small towns between Bogota and Medellín — are home to several haciendas that welcome honeymoon couples and other romantics. High in the verdant mountains, guests receive a four-wheel drive vehicle with a driver and private guide to help them to experience the region. In addition to plantation tours, visitors can also go horseback riding, unwind in a spa, and visit thermal springs. A set of modern huts stand between the tallest seaside mountains in the world and the ocean. In this pure, pristine environment, honeymoon couples come to listen to the sounds of nature and the beating of their own hearts. Adventures beyond include zip-lining, paragliding, rock climbing, and bird watching. The one time of year when this region gets raucous is during the four days preceding Ash Wednesday. That's when the multi-cultural Carnivale takes place in Barranquilla, and it's an event so extraordinary that UNESCO deems it a Masterpiece of the Oral and Intangible Heritage of Humanity.